President Robert Mugabe's own party ousted him as president on Sunday and gave him until Monday to step down. A deadline for Robert Mugabe to resign as Zimbabwe's president came and went Monday without a single word from the embattled leader. 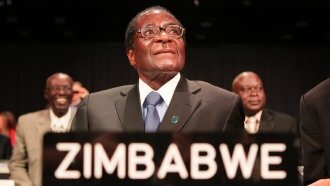 Mugabe's own Zimbabwe African National Union-Patriotic Front party ousted him as president on Sunday and gave him until the next day to step down. And now, members of the party are reportedly preparing to discuss his impeachment. Mugabe was expected to announce his resignation during a televised speech Sunday night. Instead, he promised to preside over a party congress scheduled for next month. Mugabe has been under house arrest since the country's army moved into the capital last week. Many were angered by his decision to fire his vice president, which was seen as an attempt to establish first lady Grace Mugabe as his successor. Not long after, thousands of people flooded the streets calling for Mugabe's resignation. Impeachment proceedings against Mugabe could begin as early as Tuesday.